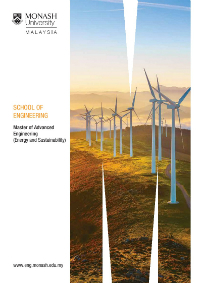 Why study a Master of Advanced Engineering (Energy and Sustainability)? The Master of Advanced Engineering (Energy and Sustainability) is designed for working engineers and engineering graduates with an ambition to lead. Addressing the pertinent demands in sustainable energy development, the course guides students to greater applicable knowledge in this area of specialisation and to succeed in complex problem solving methods. This program is ideal for those who aspire for career advancement in the competitive global environment. Students will acquire an advanced understanding in energy and sustainability and the ability to develop solutions to complex engineering problems. Students will study core units in engineering leadership and engineering analysis to strengthen their abilities in critical reasoning, innovation and strategic thinking. This program offers a research pathway option as an alternative route for students to progress from a coursework master’s program into a PhD program. The research option requires the recommendation of the Associate Head of School (Graduate Research) and approval from the Faculty/ MGE (Monash Graduate Education). The Master of Advanced Engineering degree can be undertaken over one year of full-time or two years of part-time study. Applications must be submitted to the Admissions Office using a completed application form, accompanied by relevant certified copies of academic transcripts and a non-refundable application fee of RM100. Download our latest Master of Advanced Engineering brochure.